IT'S FINALLY HERE! If you haven't had the opportunity to pick up your very own copy of Marissa Meyer's HEARTLESS, the title officially hit shelves yesterday morning, and the finished copy is positively gorgeous in person. I'm so excited that it's finally available for everyone to read, and I'm equally pumped that I'm part of Raincoast Books' blog tour for the title! Today I'll be featuring my glowing "5/5 Cupcakes" review, in addition to an exclusive excerpt on The White Rabbit. Be sure to stay tuned to the blog tour for more amazing reviews and excerpts. Catherine may be one of the most desired girls in Wonderland, and a favorite of the yet-unmarried King of Hearts, but her interests lie elsewhere. A talented baker, all she wants is to open a shop with her best friend and supply the Kingdom of Hearts with delectable pastries and confections. But according to her mother, such a goal is unthinkable for the young woman who could be the next Queen . At a royal ball where Cath is expected to receive the king's marriage proposal, she meets Jest, the handsome and mysterious court joker. For the first time, she feels the pull of true attraction. At the risk of offending the King and infuriating her parents, she and Jest enter into an intense, secret courtship. 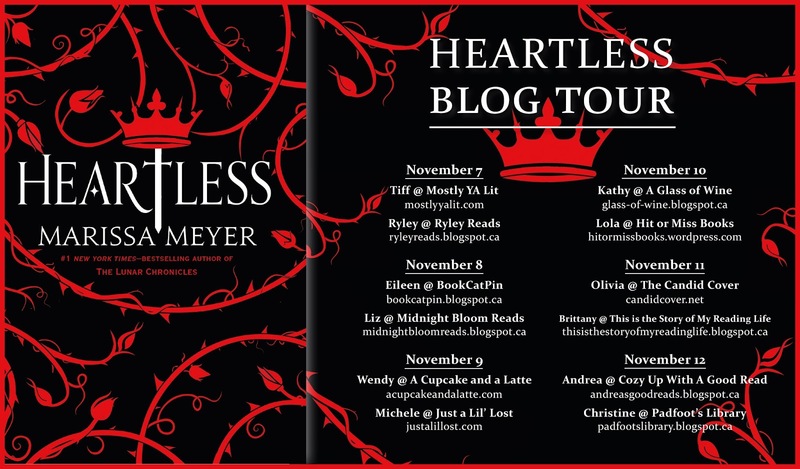 To state that I was only mildly anticipating Heartless by Marissa Meyer is an understatement. Having adored the Lunar Chronicles series, which first introduced Marissa's incredible knack for rewriting fairytales and making them something completely new and ultimately thrilling, I was certainly anticipating the release of her Alice in Wonderland retelling from the POV of the Queen of Hearts. "Hearts was not safe. The Jabberwock was real and it was here and they were not safe." 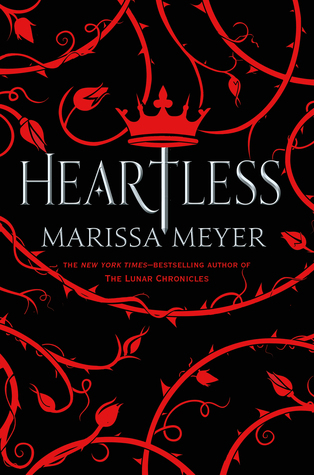 Heartless by Marissa Meyer dove into a world that was all so familiar to this Lewis Caroll fanatic. Expecting something that was as trippy and as topsy turvy as the Alice in Wonderland classic that first introduced the much older and far more sinister Queen of Hearts, I was surprised to find a Wonderland not as crazed as I had presumed I'd find. I was also surprised to find how much I LOVED reading from Catherine's POV, having her be the future Queen of Hearts and the ultimate villain in Alice's tale. The normalcy of her personality, her wants, and her talents were all so real and added to my love of reading her perspective. She was a character in which I could relate, and the discovery of the truths in her past and her present, made knowing what the future held for her even more foreboding - I loved it! "The white rose tree by the arches. I want it removed immediately." In addition to loving Catherine's perspective, I also couldn't help falling for Jest and Cheshire, in addition to the White Rabbit, Hatta, and the King. Not only were their introductions phenomenal, but the parts they played in Catherine's story, in addition to their own personal growth, added an abundance of depth to Heartless, that not only made the tale overwhelming brilliant but additionally made it a personal favourite in the YA genre. Overall, it goes without further explanation, that I absolutely adored Heartless by Marissa Meyer. The characters, the world, simply everything about the title had me breezing through the title in a sprint to the finish. And that ending?! MAGNIFIQUE! I certainly hope to see more retellings just as Heartless in the near future, and furthermore I highly recommend the title to readers of all ages seeking an escape from our world. “Do you think so, Mr. Rabbit?” asked Cath’s father, pleased with the compliment. He spent a moment patting his head, as if to confirm the flattery. Amazing review, Wendy! I'm so happy to hear you enjoyed it! LOVE her fairytale retellings, they're truly a different spin on something we all know and of course she makes her characters completely compelling!